Brian Startare’s act of kindness shown towards his son Braydon happened rather unexpectedly. However, his actions set the gold standard for all dads to follow if their child ever seems to hit an unexpected rough patch. Braydon, who was participating in his South Jersey school’s end of the year talent show, caught some unexpected stage fright as he began his comedy routine, which he worked on with his dad a few weeks prior to the show. It was then when Brian sensed Braydon might not be able to go on. He had to act fast. “I knew he was struggling. I just thought he wasn’t going to finish. I knew he wanted to, and I just didn’t want him to be disappointed,” said Brian, who stood by the side of the stage encouraging Braydon. What followed was nothing short of inspiring. Brian, a former Philadelphia sports talk radio show host and current public address announcer at Saint Joseph’s University, stopped filming Braydon, promptly joined him on stage, put his arm around his son, and said “We’re gonna do this together.” What was once a solo act became a comedy duo, and the two received several rounds of applause. In fact, the gesture was so seamless on Brian’s behalf that many in the audience assumed his arrival was simply part of the show. 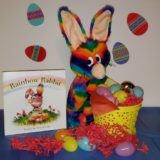 Check out Rainbow Rabbit’s Educational School Programs Here! In regards to his act of kindness, the elder Startare was modest, claiming it was something any father would do to help their child. “Be a good dad. Be a good parent. Set good examples. Raise good people,” he said. You can watch the heartfelt video below. One of the lessons in our Rainbow Rabbit Anti-Bullying Educational Program is called Witnessing Bullying Situations. In the lesson, students are taught how to address/handle various bullying situations by utilizing strategies. This is a very pivotal lesson in the program. Eight out of 10 times, other students are witnesses to bullying. Even though most students do not approve of bullying behaviors, however, not many intervene on behalf of those being bullied.